An intimate, gripping Fantasy Romance you will want to savor even as you race through the pages to find out what is really going on. Jo is about to marry James. He is standing outside, waiting for her to come down for the ceremony to begin. She can see him through the window. Jo’s brother, Spencer, is there too, talking and joking with James to calm his nerves. Then Jo’s sorceress aunt, Rowellyn, appears and informs Jo she will never marry James. She must go back in time and undo everything that has happened between them. Whatever Jo does, her life will be unbearable, but if she does exactly as Rowellyn asks, the lives of her friends and family will be spared. If, however, she refuses to go back, or tells anyone what is happening, James will die. Jo has no choice. She takes one last longing look at James through the window. She will now have to arrange for James to fall in love with someone else - the vengeful Rowellyn demands it. But, as Jo will soon discover, in the land of illusion, nothing is certain. My Review: Just minutes before her wedding, Jo is faced with an impossible choice--give up her true love forever and live her life alone, or face the wrath of her cruel Aunt who vows to harm everyone Jo has ever loved. What choice is there, really? Jo decides to go back in time, before she ever met James, and before her sister, Gabriella, gave up her powers of sorcery. Rowellyn wants Jo to make certain Gabby embraces the family curse, ensuring Gabby is a great sorceress, while Jo is resigned to an empty, lonely life. But, Jo isn't the person she used to be two-and-a-half years ago. She makes mistakes. And, soon, her secret is revealed, plunging Jo headlong into danger. Can she find a way to defeat Rowellyn? Can true love prevail? Jo learns that some things cannot be changed. Having read Reflections (the first release in the Eternal Curse series), I was a bit nervous about reading this. I wasn't sure I would enjoy a book that involves going back in time. (I loathed the movie, Groundhog Day.) 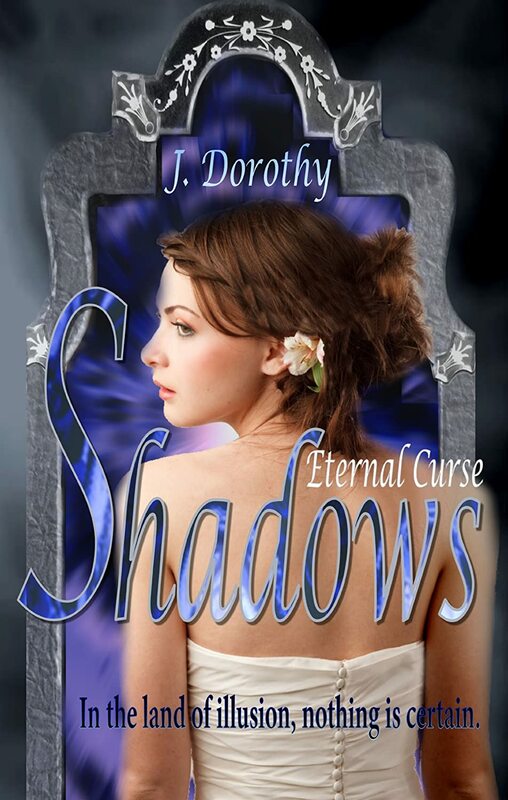 All my worries slipped away the moment I began reading Shadows. This book was magical and charming, just like Reflections. Though some events were a bit similar to the other book, the re-telling was entirely different. It wasn't long before Jo's new timeline completely veered away from the past. New characters and settings were introduced in this book, and new secrets revealed. A unique mystery unfolded and it was hard to know who to trust. Only true love and true evil were constants from one book to the next. The dramatic ending was icing on the cake of a brilliantly crafted novel. Though the subject matter is appropriate for a broad Young Adult audience, I'd recommend it to New Adult fans as well.